Equilibrioception or sense of balance is one of the physiological senses. Broadly defined, a sense is a mechanism or faculty by which a living organism receives information about its external or internal environment, allowing it to react accordingly. 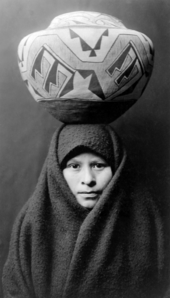 The sense of balance reflects an awareness of equilibrium involving the perception of gravity. It helps prevent humans and animals from falling over when walking or standing still. In humans, equilibrioception is determined by the level of fluid (properly called endolymph) in the labyrinth—a complex set of tubing in the inner ear. The vestibular system present in humans and other vertebrates appeared over 300 million years ago (MLB 2007) and involves remarkably complex and harmonious coordination of parts of the body (semicircular canals, otoliths, nerves, brain, eyes, and so forth) and other senses (visual system, proprioception). Equlibrioception is so important that some believe it was among the first senses to appear in the history of life (MLB 2007). Equilibrioception and proprioception are both physiological senses and some definitions of proprioception do not make a distinction between it and equilibrioception. However, these terms are generally differentiated. Proprioception is the sense of the relative position and movement of neighboring parts of the body and muscle tension. Unlike the six exteroceptive senses (sight, taste, smell, touch, hearing, and balance) by which we perceive the outside world, and interoceptive senses, by which we perceive the pain and the stretching of internal organs, proprioception is a third distinct sensory modality that provides feedback solely on the status of the body internally. It is the sense that indicates whether the body is moving with required effort, as well as where the various parts of the body are located in relation to each other. Proprioception, the perception of "body awareness," is the "unconscious" awareness of where the various regions of the body are located at any one time. This can be demonstrated by anyone's closing his or her eyes and waving the hand around. Assuming proper proprioceptive function, at no time will the person lose awareness of where the hand actually is, even though it is not being detected by any of the other senses. It involves information from sensory receptors located in muscles, tendons, and joints and integrating this with information from other receptors (such as vestibular receptors used in the sense of balance or equilibrioception) to provide awareness of the relative position of the parts of the body and the direction and rate movement of limbs, that is, proprioception. Kinesthesia is a term that often is used interchangeably with proprioception; however, kinesthesia specifically excludes the sense of equilibrium or balance. An inner ear infection, for example, might degrade the sense of balance. In the broader sense of proprioception (including the sense of balance), this would degrade the proprioceptive sense, but not the kinesthetic sense. The infected person would be able to walk, but only by using the person's sense of sight to maintain balance; the person would be unable to walk with eyes closed. In the narrower sense of proprioception (not including the sense of balance), kinesthesia and proprioception would be the same. The vestibular system, or balance system, is the sensory system that provides the dominant input about movement and equilibrioception. Together with the cochlea, a part of the auditory system, the vestibular system constitutes the labyrinth of the inner ear, situated in the vestibulum in the inner ear (Figure 1). the otoliths, which indicate linear translations. The vestibular system sends signals primarily to the neural structures that control our eye movements, and to the muscles that keep us upright. The projections to the former provide the anatomical basis of the vestibulo-ocular reflex, which is required for clear vision; and the projections to the muscles that control our posture are necessary to keep us upright. Figure 1: The labyrinth of the inner ear, from the left ear. It contains i) the cochlea (yellow), which is the peripheral organ of our auditory system; ii) the semicircular canals (brown), which transduce rotational movements; and iii) the otolithic organs (in the blue/purple pouches), which transduce linear accelerations. The light blue pouch is the endolymphatic sac, and contains only fluid. As the basis of our perception of a three-dimensional world, our vestibular system contains three semicircular canals in each labyrinth. They are approximately orthogonal to each other, and are called the horizontal (or lateral), the superior (or superior), and the posterior (or inferior) semicircular canals. Anterior and posterior canals may be collectively called vertical semicircular canals. The anterior and posterior semicircular canals detect rotations of the head in the sagittal plane (as when nodding), and in the frontal plane, as when cartwheeling. Both anterior and posterior canals are oriented at approximately 45° between frontal and sagittal planes. The movement of fluid pushes on a structure called cupula, which contains hair cells that transducts the mechanical movement to electrical signals (Boron and Boulpaep 2005). Vertical canals are coupled in a crossed fashion; in other words, stimulations that are excitatory for an anterior canal are also inhibitory for the contralateral posterior, and vice versa. 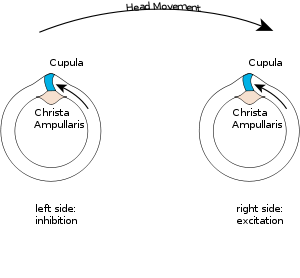 The vestibulo-ocular reflex. A rotation of the head is detected, which triggers an inhibitory signal to the extraocular muscles on one side and an excitatory signal to the muscles on the other side. The result is a compensatory movement of the eyes. α is a proportionality factor, and s corresponds to the frequency. For humans, the time constants T1 and T2 are approximately three ms and five s, respectively. As a result, for typical head movements, which cover the frequency range of 0.1 Hz and 10 Hz, the deflection of the cupula is approximately proportional to the head-velocity. This is very useful, since the velocity of the eyes must be opposite to the velocity of the head in order to have clear vision. While the semicircular canals respond to rotations, the otolithic organs sense linear accelerations. We have two otolithic organs on each side, one called utricle, the other Saccule. The otoconia crystals in the Otoconia Layer rest on a viscous gel layer and are heavier than their surroundings. Therefore they get displaced during linear acceleration, which in turn deflects the ciliary bundles of the hair cells and thus produces a sensory signal. Most of the utricular signals elicit eye movements, while the majority of the saccular signals projects to muscles that control our posture. While the interpretation of the rotation signals from the semicircular canals is straightforward, the interpretation of otolith signals is more difficult: Since gravity is equivalent to a constant linear acceleration, we somehow have to distinguish otolith signals that are caused by linear movements from such that are caused by gravity. We can do that quite well, but the neural mechanisms underlying this separation are not yet fully understood. When the sense of balance is interrupted it causes dizziness, disorientation, and nausea. Balance can be upset by Meniere's disease, an inner ear infection, by a bad common cold affecting the head, or a number of other medical conditions. It can also be temporarily disturbed by rapid and vigorous movement, for example riding on a merry-go-round. Vertigo is a major symptom of a balance disorder. Most astronauts find that their sense of balance is impaired when in orbit, because they are in a constant state of free-fall while their rockets are off. This causes a form of motion sickness called space sickness. The vestibular system is similar between humans and other vertebrates, including those as diverse as fish, turtles, and rats (Gibson 2007; MBL 2007). Highstein, professor at of the Washington University School of Medicine, states that "evolution got it right the first time, when the vestibular labyrinth first appeared more than 300 million years ago" (MBL 2007). He notes that not only were vestibular organs an early invention—perhaps one of the first sensory systems to appear—but the system of hair cells, canals, and otoliths has not changed much over the eons. While the vestibular organs in fish "are very similar to ours" (MBL 2007), equilibrioception in many marine animals is done with an entirely different organ, the statocyst, which detects the position of tiny calcareous stones to determine which way is "up." Gibson, A. 2007. Scientists receive $2.8 million for neuroscience research: NIH funding will help researchers learn more about sense of balance Ohio University Research News Jan 16, 2007. Retrieved January 27, 2008. Marine Biological Laboratory (MBL). 2007. On balance, biologists find a lot of reasons to study toadfish Marine Biological Laboratory Lab Notes 97 Volume 6, No. 3. Retrieved January 27, 2008. This page was last modified on 2 April 2008, at 06:33.